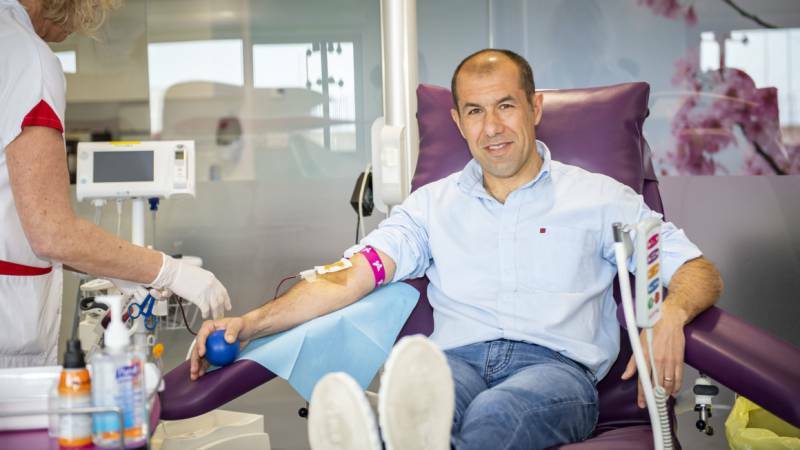 AS Monaco Supporters And Leonardo Jardim Save Lives Donating Blood. Donate at the Match. Home/News/Sport & fitness/Giving Blood at the AS Monaco Match Will Save Lives. Leonardo Jardim Joins In. Today is a wonderful opportunity to give blood. AS Monaco supporters are leading the way in helping their community and Princess Grace Hospital. Did you know that every year, AS Monaco and their supporters help in contributing the 5,000 donations of blood that are so vital for the 800 patients who receive blood transfusions in the Principality.That is why Leonardo Jardim has received such a welcome by a delighted Dr. Anne Gouverner-Valla, Head of the CHPG’s Blood Transfusion Centre. Leonardo wanted to show that he is just as dedicated as every AS Monaco supporter to giving blood.Giving blood is a simple, generous and responsible act of solidarity, for which there is no substitute in the current state of science. Today, April 13th, is the big day for donating blood at AS Monaco. The blood donation session is being held in front of the Louis II Stadium, prior to the match at 8 p.m.between AS Monaco and Stade de Reims, as part of the 32nd day of Ligue 1. Thus, from 4 p.m. until the kick off, AS Monaco supporters and their friends are particularly welcome as volunteer donors. To donate your blood go to the mobile blood collection unit on the forecourt (just next to AS Monaco’s Shop Truck). It’s a great honour for the Blood Transfusion Unit to receive you and everyone like Leonardo Jardim who in donating blood are healing and saving lives . Giving blood at AS Monaco today raises awareness of this important health issue among the whole sports community – and the wave continues to gather strength. The Government is also particularly supportive of today’s blood donation efforts by the Principality’s professional football club and its supporters. It is an important part of their Agreement with the Club.